Quest for Inter-City train: It has been a while since I last dug into my childhood LEGO collection. That time it was for the (still slightly incomplete) Quest for Lion Knights’ castle. I was strictly looking for LEGO Castle parts then. This time I’m armed with a slightly more diverse 7740 Inter-City Passenger Train set’s parts list. I have already set aside most of my black and old grey parts during the past project (that will come in handy) and as I’ve purchased most of the basic red, yellow, blue and black bricks new (all I could find), I’m not looking for those either – at least not yet. I’m probably missing a few such pieces here and there, but I’ll return to those later on. My mission on this first go was strictly special parts – train parts, minifigures, that sort of thing. I know I have the parts for 7710 Push-Along Passenger Steam Train and 7835 Road Crossing (those may be the only major LEGO Trains sets I have), so I’m looking for that kind of stuff. There are also some Classic Space items on the list. Initially, when I started the project, my expectations for the re-use value of my collection were pretty low. The quest for Lion Knights’ castle had left me a little disheartened I guess – even though my childhood collection wasn’t that small, the sheer diversity of LEGO pieces and colors guaranteed more misses than hits when trying to re-create something new. My mood picked up a little as I went through the Inter-City train list, though. I started thinking I might actually have more useful pieces than I had imagined. Would I return disappointed? Above: Decades in storage had made one of the sleeper plates brittle and it broke from two places when dismantling. 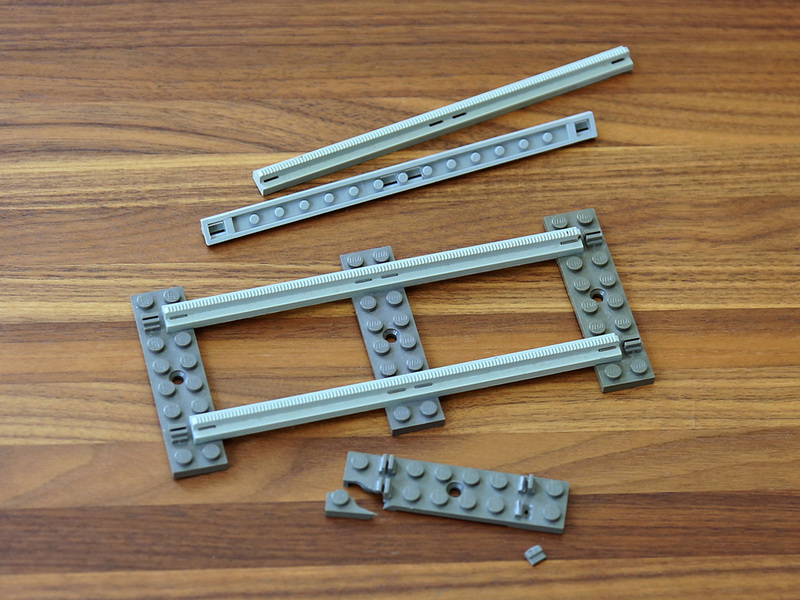 Care should be taken when taking apart these old LEGO tracks, as the clips tightening the rails to the sleepers can be pretty tight. Don’t bend, raise the rail off the plate. 3 Responses to What can I re-use for the train?